So let’s see… maybe you’re where I was a couple of years ago. Maybe you’re surfing the net looking for ways to make money online. And you’ve stumbled upon a few Wealthy Affiliate reviews like I did. So I’m going to answer this question for you right up front. Because I’ve made money on Wealthy Affiliate. As have many other Members. You can have a look at my first two income reports if you need proof. Now don’t laugh. I know $500 or $600 a month isn’t fortunes. And I know it wasn’t the fastest business growth I’ve ever experienced as an Entrepreneur. But bear with me here. So if you’re looking to make a fast buck, I wouldn’t recommend you go the Wealthy Affiliate route. Having said that, I’ve only found a few ethical ways to make fast bucks online but they weren’t dependable ways. They weren’t sustainable, long-term, pay-the-bills-monthly kind of ways. They were 5 Bucks here, 20 Bucks there… I made 50 Bucks once doing Website Testing for Userlytics (as described in my first Income Report). And that was easy money. I thought I was in the money! I was so excited! Only to find it was a once-off. I’ve never made another 50 Bucks with them again. I’ve only done one other Test for them and it was months later and they only paid me $25 this time. Which is still great considering how little time it took me, but like I said, not sustainable. I can’t live on $25 or even $50 a year. And then there are a lot of Online Scams offering Quick, Easy Money but when I’ve looked into those I’m never prepared to do what they require me to do because well, it just seems sleazy. You know, those companies that tell you to go make purchases and then cancel them a few days later. I just can’t do that kind of thing. It doesn’t seem ethical to me. 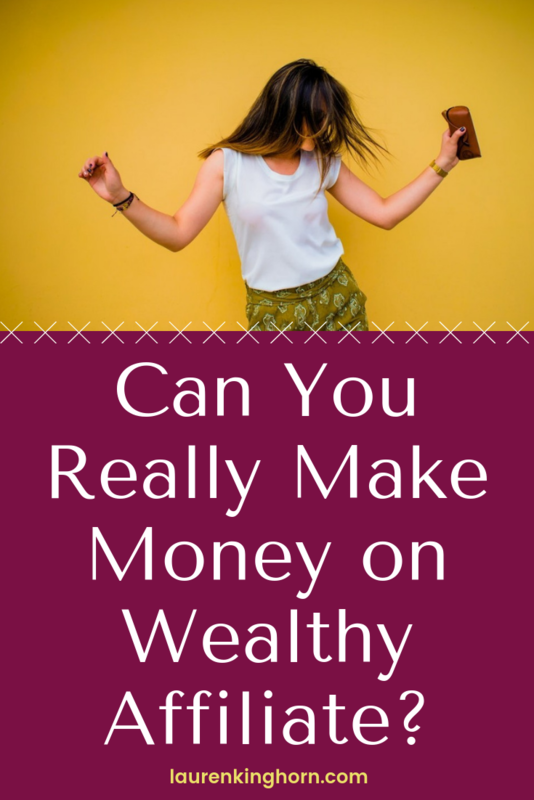 So How Do You Make Money on Wealthy Affiliate? The simple answer is you make money on Wealthy Affiliate by learning how to create your own website(s) and then monetizing them. To answer that question properly, I’ll ask and answer another one first. And you’ll learn how to do this in their very first Online Certification Training, which, by the way, is available Free to Starter Members. I found Step 1, Choosing an Interest the easiest part. I already knew what I wanted to blog about. If you have an existing business or passion you’d like to write about, this should be quick and easy for you too. Step 3, Attracting Visitors, is the Step that usually takes the longest time (unless of course you’re already someone famous, with a huge social following clamouring to hear your every word), it’s going to take some time to write enough rich content to build a loyal following, i.e. Traffic to your site. Kyle teaches you how to access organic traffic, which simply means visitors finding your site when they are searching for something on Google, Bing or Yahoo (or any of the Search Engines). This is where Keyword Research comes in. More about that later. And teaches you how to set these up. Although Affiliate Marketing is the main way Kyle recommends earning revenue from a website, there are also tons of other ways to earn money that you will learn along the way (and I’ll touch on some of these later). What Exactly Do You Learn about Monetizing a Site? And more… so much more. Wealthy Affiliate doesn’t just teach you how to make money, it also offers you ways to make money. Here are 3 more ways you can make money on Wealthy Affiliate. They have their own Affiliate Program where you can excellent commission either monthly or annually. They also own Jaaxy and Jaaxy also has an Affiliate Program where you can earn excellent commission. Through their Open Education Project you can earn money by creating popular tutorials. On top of teaching how to succeed with well-known Affiliate Programs such as Amazon, Clickbank etc, Wealthy Affiliate also has their very own lucrative Affiliate Program. Know nothing about Affiliate Marketing? Don’t worry, Wealthy Affiliate has got you covered. Kyle teaches you how to make money step-by-step in Affiliate Bootcamp. Even Starter Members (Members who sign up free) are able to take the first Phase of Affiliate Bootcamp and are entitled to the following commission. This works especially well if you market offline as well as online (i.e. if you have friends who are keen to build their own websites too and jump in with you). Think how excited you’ll be when your first website is up… and remember Enthusiasm sells. If you show your website to someone you know has been considering setting up their own website, they may just buy in. If you had no money at all, you’d want to introduce 2 Premium Members in your first month. That way you’d earn $8 in Month 1 and $23.50 in Month 2, which is more than enough to cover your first month’s membership of $19. Now that you’re a Premium member yourself your own income doubles and your monthly fee is almost covered by your two Premium Members. You would earn $47 a month commission, so you’d only be paying in $2 a month for the rest of your training plus all the tools etc. Wealthy Affiliate has to offer. If you signed up one Premium Member who went Yearly, you’d have enough money to pay for your first month of $19, your 2nd month of $49 and you’d have $19.50 profit. Jaaxy is a brilliant Keyword, Niche Research and SiteRank Tool. Read more about Jaaxy here. I use Jaaxy for every single post I publish, whether it’s a guest post, contributed post or my own. Jaaxy is a tool many bloggers use even if they are not members of Wealthy Affiliate and therefore it has a stand-alone website as well. The awesome thing is, there is a Free Version of Jaaxy for Wealthy Affiliate Premium Members, Jaaxy Lite, which is perfect when you’re just starting out. There are two elite versions of Jaaxy. Jaaxy Pro and Jaaxy Enterprise. And even more good news is that Jaaxy also has it’s own Affiliate Program. Once you’ve been a Member of WA for 3 months you can start sharing your own knowledge by adding your own Tutorials or Video Training. You can earn ongoing income this way. Wealthy Affiliate pays you based on how many people have read or watched your entire training, liked it, commented on it and how responsive to are you to comments and questions. Bottom line: The more popular your Training is, the more is you earn. This is how Wealthy Affiliate has landed up with an incredible bank of Training, other than the official courses. I even have a couple of my own Tutorials (been a bit slack, I know). Are there other ways to make money with a website? Sure. There are plenty of ways. Once you have built an Authority website, you have a valuable asset. And you can learn how to do all this in Wealthy Affiliate. Remember, other than the core training, there are also thousands of tutorials added by Wealthy Affiliate Members, many of whom are experts in their field. You might find, for example that you actually love the first bit you learn at Wealthy Affilliate – creating the framework of a website and that’s a skill you can market. I made a few bucks this way when a friend of mine wanted a very simple website created for her Playschool. Here are a few skills you might learn while you’re building your own site, that you others will pay you to do for them. You can sell these skills on freelance websites like Fiverr or Upwork or to your friends. There are many members on Wealthy Affiliate who are earning money doing all kinds of things online. I discovered Wealthy Affiliate when I read a Review post about Steve of I’ve Tried That and so I’m actually one his referrals. His Wealthy Affiliate Profile is also IveTriedThat. I’m also on his email mailing list. He published a couple of excellent posts the other day that tie into what I’ve saying and give you some more excellent ideas of how you can make money online. Here’s a post by Nathaniell of One More Cup of Coffee about the multiple sites he’s created. Nathaniell wrote a couple of BRILLIANT posts recently that list plenty of Success Posts on Wealthy Affiliate.